Hello again lovelies. I hope you all had a fantastic week. Once again, I am a day late to post this. I think Mondays must be too hectic. Maybe I will stick to Tuesdays from now on, but who knows with me. I never can make up my mind. Well, almost never. One thing I have made my mind up about is how much I love Nutrisystem. Every week when I post these updates, and every day when I am enjoying great tasting, filling food that really does work for weight loss I am reminded of how much I love Nutrisystem. 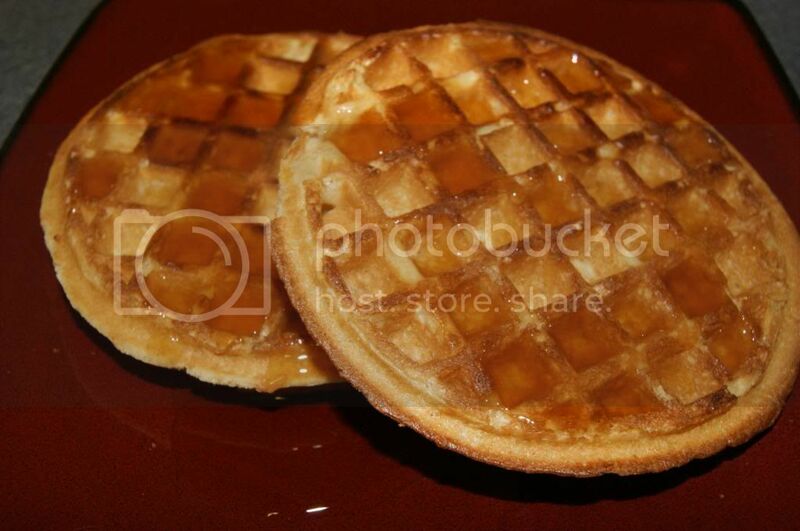 In fact, I just finished up my breakfast, DELICIOUS Golden Waffles with Sugar Free Syrup. AMAZING! The Golden Waffles are one of my most favorite foods on the program. Don't they look fabulous? They really are. They do not taste "Diet" at all, and they are the same size as 2 regular frozen waffles, so you are not sacrificing anything. PLUS I also get a Power Fuel(protein) with breakfast, which can be 1 egg, some Fat Free yogurt, or one of numerous other foods. I usually go for my yummy Nutrisystem Refreshing Coffee Protein Shake, and today was not exception. In a couple hours I get a morning snack, then lunch, hen an afternoon snack, Dinner and then dessert. Sounds like a lot of food, right? It is. Not too much, but enough to be satisfied and never feel hungry or deprived. That is the main reason that Nutrisystem works so well, because you are losing for the long term. Other plans starve you thin, but as soon as you begin to eat normally(even healthy foods in normal portions) you will gain it all back. That is not only pointless, it is unhealthy. I much prefer eating my way thin and keeping the weight off by re-learning how to eat. Nutrisystem, thankfully, has taught me that. 1.8 POUNDS and 1/2 INCH!! 52.8 POUNDS and 25 INCHES!! Every single week I get closer and closer to my overall goal. No matter how small the progress might be, it is always progress, and I owe it all to Nutrisystem. Nothing else ever worked for me. I am so glad I gave myself the chance to succeed with Nutrisystem.